Should I use a water-based latex paint or an oil-based paint? That depend s. Both will do an excellent job under most circumstances. Water-based paints have a number of advantages especially for of do-it-yourselfers including water clean-up, fast dry, lower odor and general ease-of-use. In addition, top-quality latex paints generally have excellent adhesion to most surfaces and generally exhibit superior resistance to bleaching and fading when com pa red to oil- based paints. However, the two areas we strongly recommend the use of oil based paints are on kitchen cabinets, due to the high frequency of handling with oily fingers, and in high humidity areas, such as bathrooms without good ventilation. You know if you have a high humidity problem if the mirrors fog up during a shower or bath, or if there are amber colored droplets on the ceiling. In Colorado, due to our high UV light and 300 days a year of sunshine, and our low humidity, we do not recommend oil based paint being used on outside wood. It becomes too brittle too fast and will quickly begin to crack and peel. Latex used outside will remain flexible, hold its color longer and will not chalk.Exterior Paint Warrantees...What is their purpose? Are they helpful at sincerely reassuring consumers of paint longevity, or are they misleading? When we purchase a new automobile, the manufacturer is kind enough to provide us with a New Owner Manual that helps us understand that we have some responsibilities to receive full value from our purchase and how to keep our warranty in force. In this manual, we are made aware of periodic preventive maintenance tasks, which if not performed, severely shorten our automobile's life expectancy. Do consumers need a New Owner Manual when they purchase exterior paint? A typical exterior paint warrantee makes statements similar to, "if the label directions are followed, our paint is warranted against peeling, flaking, blistering as a result in a defect in the product". 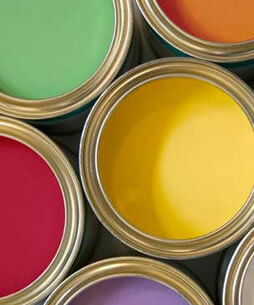 In my experience, I have never known of paint ever peeling, flaking or blistering because of a defect in the product. The causes of these failures have always been due to either painting over a dirty or chalky surface (causing inter-coat peeling) or moisture has found some way to get behind the paint (causing peeling to the substrate). Neither of these causes of coating failure would be covered under the terms of the warranty. From a paint manufacturer's point of view, the warranty is intended to indicate how long it would take for the elements to wear down the coating. Unfortunately the types of paint failures mentioned in the warrantee usually occur long before the paint has a chance to weather down, "cheating" consumers out of the fu II value of their paint. The warrantee, or assurance of high paint quality, is perceived by consumers to mean "This paint will not peel, flake or blister, for the term of the warrantee, period." After the paint job is completed, average consumers ignore their painted surfaces until a condition of degradation is too great to ignore. Without understanding the cause of these paint failures, customers conclude the product has failed to perform properly. Those of us behind the sales counter in our paint stores are well aware of i rate customers who never received this education. It may be more honest and accurate to give this warranty: "We guarantee that if you paint over a dirty or chalky surface, or you allow water to get behind the paint, THE PAINT WILL FALL ON THE GROUND". It would be wise to immediately follow this statement with, "Now, let us help you understand how you can prevent these failures from happening so you receive the full value out of any exterior paint you use". We paint store folks would be of greater service to our customers if we explained that our exterior paint products will eventually need a little annual preventive maintenance and that the paint job may be extended two or three times longer if the consumer takes a little time each year to identify and repair areas that have started to fail. A little scraping, priming, caulking or spackling followed by touch up will prevent the damaged areas from becoming many times worse the following year. 0 n new jobs and maintenance work, priming first, followed by close attention to cauI king every space that would otherwise allow moisture intrusion, is important to provide a watertight film. SHOULD I USE OIL BASE OR LATEX BASE PAINT? Should I use a water-based latex paint or an oil-based paint? That depend s. Both will do an excellent job under most circumstances. Water-based paints have a number of advantages especially for of do-it-yourselfers including water clean-up, fast dry, lower odor and general ease-of-use. In addition, top-quality latex paints generally have excellent adhesion to most surfaces and generally exhibit superior resistance to bleaching and fading when com pa red to oil- based paints. However, the two areas we strongly recommend the use of oil based paints are on kitchen cabinets, due to the high frequency of handling with oily fingers, and in high humidity areas, such as bathrooms without good ventilation. You know if you have a high humidity problem if the mirrors fog up during a shower or bath, or if there are amber colored droplets on the ceiling. In Colorado, due to our high UV light and 300 days a year of sunshine, and our low humidity, we do not recommend oil based paint being used on outside wood. It becomes too brittle too fast and will quickly begin to crack and peel. Latex used outside will remain flexible, hold its color longer and will not chalk. NEED ADVICE ON PAINTING INSIDE YOUR HOME? There is quite a bit to know but none of it is difficult. There is no reason you can not have an excellent job if you understand the basics. Let Benjamin Moore talk YOU through the basics There are some things that can go wrong with a coat of paint applied to the inside of your home. These "problems" are never caused by bad paint. This link may help you identify and solve a paint problem you see with your inside paint. HOW LONG WILL PAINT LAST ON MY HOUSE? HOW LONG WILL PAINT LAST IN THE CAN? SHOULD I BRUSH, ROLL OR SPRAY? 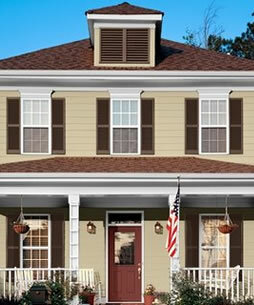 WANT A PAINT COLOR MATCHED? CAN I PAINT VINYL OR ALUMINUM SIDING?